Most studies on mining workers in India have focused on pneumoconiosis and NIHL. However this study was undertaken to assess over all morbidity in these workers. This descriptive study included all 314 mining workers employed in an open-cast iron ore mine in a rural area of Quepem taluka in South Goa from November 2010 to April 2011. Data were collected by interviewing the workers at their workplace. Requisite investigations were carried out at the Occupational Health Service Clinic of the mining company. Ethics committee permission was obtained for the study. Majority of mining workers i.e., 207 (65.9%) belonged to 18-35 years age group. There were only five female mining workers, who worked as helpers. All the mining workers included in the study were on site mine workers. The mining workers were categorized according to their present work [Table 1]. Two workers suffering from pneumoconiosis were males; one 26 years old working as a plant operator and the other was 41 years old working as a supervisor. 102 (32.5%) workers had radiological abnormalities of perfusion grade 0/1. The prevalence of pneumoconiosis was 1.25% among the plant operators and 1.43% in supervisors. 9 (2.9%) and 1 (0.3%) of the mining workers had obstructive impairment and combined restrictive and obstructive impairment respectively. Among the 116 workers with hearing loss, 111 (95.7%) had slight impairment, four had moderate impairment and one severe impairment in hearing. There was no case of profound impairment. Among the mining workers with defective vision, three workers had distant vision <6/60 and one had near vision of N18. No worker had defective color vision. There were two cases with high blood urea, one 56-year-old male working as a supervisor and another 52-year-old female working as a helper. The case with high serum creatinine was a 50 year-old male working as a plant operator. The prevalence of diabetes and impaired glucose tolerance was 5.1% and 24.2% respectively. Hypertension was present in 8.3% and dyslipidemia in 37.5% of the mining workers. 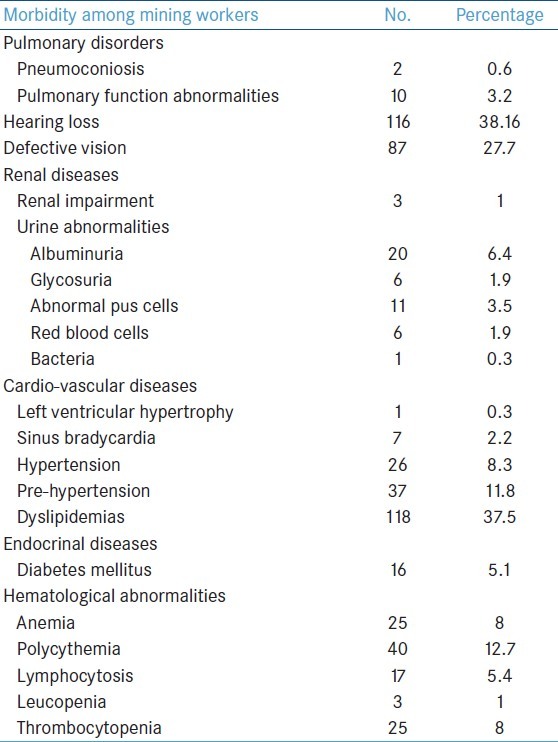 Hematological anomalies are summarize in [Table 2]. Development of pneumoconiosis among the mining workers depends on the chemical composition of dust, fineness of dust, concentration of dust in the air, period of exposure and health status of the exposed worker. In Pilbara iron ore miners the prevalence of pneumoconiosis was 2.3%. The prevalence of pneumoconiosis in the present study is low as compared to the above study, which may be due to the following reasons: All the mining workers in the present study have been working for <10 years, most of the workers are young workers and the type of ore mined. In a study among 2586 miners from Rajasthan, 14.3% had a restrictive impairment, 1.01% had combined restrictive and obstructive impairment, 2.78% had obstructive impairment. The lower prevalence of abnormal pulmonary function in the present study as compared to the above study could be due to same reasons of younger age and less period of working and only two cases of pneumoconiosis with perfusion grade of 1/1 were found. 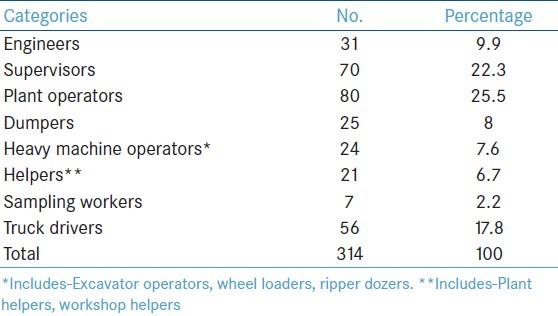 In the present study, 38.16% of the mining workers had hearing loss. Similar finding were reported in a study conducted by Amedofu among gold mining workers in Ghana, where 23% of the workers had NIHL. Since the audiometry findings are not compared with pre-placement audiometry finding no definite conclusion can be made that the hearing loss is occupational related. Most common urine abnormality in the present study was albuminuria, among 6.4% of the mining workers, similar to finding among Rajasthan mining workers  . Significant ECG changes in the present study (2.5%) were also similar to Rajasthan mining workers  . Prevalence of diabetes was seen as 5.1%, lower compared with two recent population based studies in Chennai which had shown diabetes prevalence as 12-16%. But so far as hypertension was concerned, the present study (8.3%) had similar findings with that of Rajasthan (8.6%). Prevalence of dyslipidemia was 37.5% in the present study. Estari and Reddy conducted a study in the adult population in Andhra Pradesh where the prevalence of dyslipidemia was observed in 52.7% in males. The prevalence of hypertension, diabetes mellitus and dyslipidemia were seen lower in the present study as compared with the general population because the majority of the mining workers are in the young age group and they are from a rural area. The lower prevalence may also be explained by the healthy worker effect. The prevalence of polycythemia among mining workers was 12.7%. The high prevalence could be due to relative polycythemia, found in hard working hyperactive middle aged men (stress polycythemia). The most common abnormality in the differential count was lymphocytosis. Nearly 36.6% of the mining workers had raised erythrocyte sedimentation rate (ESR). ESR is a non-specific hematological parameter that is raised in acute and chronic infections. Sometimes raised ESR may be present without any obvious cause. Detailed history and examination and further investigations are required to find out the cause for the polycythemia, lymphocytosis and raised ESR. Since the findings were not compared with the pre-placement records and as most of the workers are young with duration of exposures <10 years, relationship cannot be definitely determined. The present study findings are suggesting an association between the occupation in mining with pneumoconiosis, compromised lung function and hearing loss. But for the other finding further analytical studies are required to see for any association. Airborne respirable dust survey and noise monitoring studies also need to be carried out. As the present study is a descriptive one, therefore it cannot be ascertained whether the findings of the study among the mining workers are occupation related. Majority of the mining workers belong to the young age group of 18-35 years. Hence the observed prevalence of the diseases among these mining workers would differ from that in the general population. The mining workers are employed in the mines after pre-placement examination and only healthy workers are employed (healthy workers effect). All the mining workers in the present study are employed for <10 years in this occupation. Therefore the morbidity pattern of some diseases that have long latency like pneumoconiosis and NIHL may differ from studies carried out in workers employed in other mines who have worked for longer durations. 1. Banerjee KK. Iron-ore dust and its health impacts. J Environ Health 2006;6:11-6. 2. Edstrom HW. Respiratory diseases in iron ore miners and millers. Can Fam Physician 1989;35:1517-20. 3. Amedofu GK. Hearing-impairment among workers in a surface gold mining company in Ghana. Afr J Health Sci 2002;9:91-7. 4. ILO. Guidelines for Use of ILO International Classification of Radiographs of Pneumoconiosis. Revi. Geneva, Switzerland: International Labour Office; 1980. Occupational Safety and Health Series No. 22 (Rev). 5. World Health Organization. Prevention of blindness and deafness. Available from: http://www.who.int/pbd/deafness/hearing_impairment_grades/en/index.html. [Last accessed on 2008 Jan 17]. 6. Standards of medical care in diabetes. American Diabetes Association. Diabetes Care 2011;34:S13. 7. Chobanian AV, Bakris GL, Black HR, Cushman WC, Green LA, Izzo JL Jr, et al. The Seventh Report of the Joint National Committee on Prevention, Detection, Evaluation, and Treatment of High Blood Pressure: The JNC 7 report. JAMA 2003;289:2560-72. 8. Final Report. The Third Report of the National cholesterol Education Programme (NCEP) Expert Panel on APT III. United States: National Institute of Health. National Heart, Lung and Blood Institute; 2002. NIH Publication No. 02-5215. 9. Musk AW, Klerk NH. Radiographic abnormality and duration of employment in Western Australia iron ore mines. Med J Aust Environ Res 1987;42:455-68. 10. Khanik A. Health status evaluation of miners in Rajasthan. NIMH Newsletter (National Institute of Miners Health) 2010;1:2. 11. Mohan V. Dr. Mohan′s Handbook of DM. 2 nd ed. India: DMDSC; 2009. p. 2. 12. Estari M, Reddy AS. The investigation of serum lipids and prevalence of dyslipidemia in urban adult population of Warangal district, Andhra Pradesh, India. J Biol Med 2009;l:61-5. 13. Frank F, Chesterman C, Penington D, Rush B. De Gruchy′s Textbook of Clinical Haematology in Medical Practice. 5 th ed. Victoria: Blackwell Sciences Ltd.; 2004.